Dipa Karmakar scripts history, first Indian to enter vault finals in Rio Olympics 2016 : Finally, the wait is over and Dipa Karmakar gave the millions of Indian a reason to smile and celebrate. 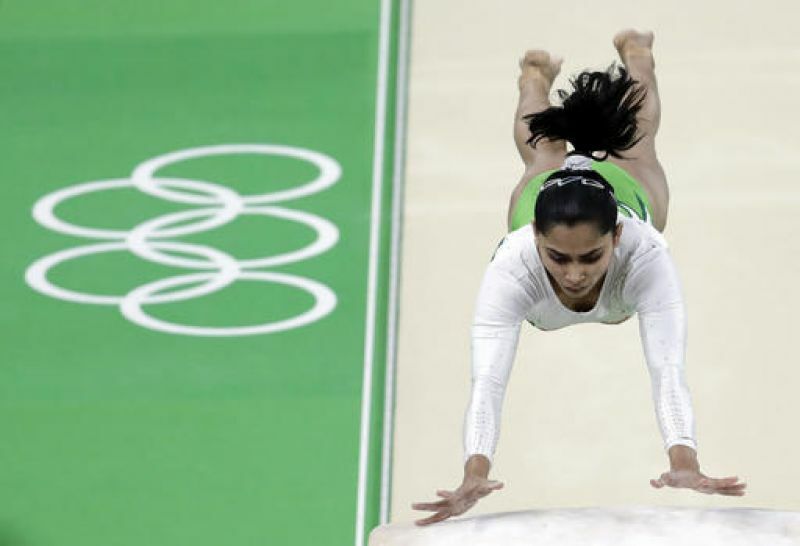 Dipa who is a gymnast inked a history as she became the first Indian to make the cut for the individual vault finals in her debut Olympic Games. This performance of Dipa is getting appreciation from the whole India because she reached the final after finishing 8th in the qualifying round. Also, Dipa is the first woman to qualify for the Olympics and she is a Tripura-based girl. And it takes a lot for a girl to reach Olympics, especially when she is from a small place like Tripura. She after the who attempts managed to perform her much-appreciated ‘Produnova’ vault cleanly to secure 14.850 points. Dipa after this achievement is reached the top 8 and will play on August 14 as the top-8 made the cut for the medal round as this was enough to secure her a place in the finals that is scheduled to play, a day before the Independence Day and may be Dipa will gift a special gift to her country Indian on 14 August. Dipa reached Top 8 after she secured 7.000 on difficulty and 8.1 on execution in her first attempt and then for difficulty was a tad lower at 6.000 on the second attempt. But the moment came in the final attempt when she landed low on her Produnova vault and her second vault was ‘Tsuk double full twist’ with a step to the side. Meanwhile, Simone Biles claimed the first a sensational score of 16.050. This American champion has scored brilliant 9.700 on execution in both her attempts and she is a Three-time world all-around champion . North Korea’s Jong Un Hong was a distant second and Switzerland’s Giulia Steingruber followed her and stood third. Well, Dipa deserves all these appreciation and why not, she is the first in 2016 Olympics who has given millions of Indian a moment to be proud.